Internships provide entrepreneurial students with opportunities to gain essential experience in companies from NY State (NYS) and beyond. Companies developing products or technologies related to materials can apply for matching funds for internship through our collaboration with Entrepreneurship At Cornell. The CCMR will provide 20% of the internship cost not to exceed $1,000 to selected companies developing products or technologies related to materials. Manufacturing and R&D NYS small to mid-sized businesses from the following industry sectors are eligible: materials, chemistry, energy, pharmaceuticals, food, and textile. Students from the following departments and colleges are eligible: College of Engineering, and Departments of Fiber Science and Apparel Design, Chemistry and Chemical Biology, Physics, applied Physics, and Food Science. Join these companies, hire Cornell interns! Please note that the NYS’s Empire State Development (ESD) office requires us to report annually economic impacts that resulted from the CCMR-funded project to demonstrate return on the state’s investments: economic impact reporting. The CCMR will write press releases, success stories and articles with the collaboration of the industrial partners to showcase the CCMR program and the partner company. Industry partners can contact the CCMR as they look for interns in the US and abroad. 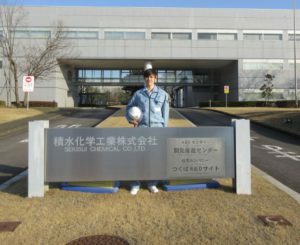 Jeremy Fredricks Cornell Materials Science and Engineering 2016, did an internship in 2017 at the Corporate Research and Development Center of Sekisui Chemical Co. in Tsukuba, Japan. Jeremy worked on development of metal catalysts for industrially relevant chemical production.